Visit of Naṭronai b. Ḥabibai. Arrival of Ḥushiel b. Elhanan. Decline in the Eleventh Century. City in the regency of Tunis, thirty miles inland from Susa, and about eighty miles south of the capital. Next to Tunis, it is the largest and most populous city in the country, and is the "Mecca" of North Africa. Kairwan, which soon became the metropolis of the province, was founded in the year 670 by 'Uḳba ibn Nafi', the conqueror of the Maghreb, as a "fortified camp": hence its name, for "Ḳairuwan" is connected by the Arabian geographers with the Persian "karawan" (camp protection). Arabian, Egyptian, and Cyrenian Jews hastened at once to the newly founded city, and Arabian historians relate that the Ommiad calif 'Abd al-Malik ibn Marwan (684-705) requested his brother, 'Abd al-'Aziz, governor of Egypt, to send 1,000 Coptic or Jewish families to settle there. At the end of the seventh century a second band of Jewish immigrants appears to have gone to Kairwan under Ḥasan ibn Nu'man, the conqueror of the Berber Kahinah, and to have fused with the first settlers. The Jews of Kairwan, like those of the rest of the Maghreb, doubtless had to suffer, in the followingperiod, from the oppression of the governor Abu Jafar, and from the fanaticism of the vindictive Imam Idris after his victory over his opponent Al-Mahdi (see Tunis). In 793 Imam Idris was poisoned at the command of the calif Harun al-Rashid—it is said, by the governor's physician in ordinary, Shamma, probably a Jew (Al-Ḳairuwani, "Histoire de l'Afrique," transl. Pelissier and Rémusat, p. 170, Paris, 1845, in "Exploration Scientifique de l'Algérie," vol. vii.). Since the Jews had lost their political power in consequence of their subjection by Iman Idris, the freer tribes of the open country settled in the larger cities and devoted themselves to trade. Thus Kairwan again received an addition to its Jewish population. About the year 800 the Aghlabite dynasty was founded; and in 909 their supremacy passed to the Fatimites. In 972 the whole province declared itself independent under the Berber Zirites, who, in 1045, ruled over the entire Maghreb. The period of greatest prosperity for the Jewish community in Kairwan extended from the end of the eighth to the beginning of the eleventh century, that is, during the rule of the Abbassids, Aghlabites, Fatimites, and Zirites. The community was highly reputed among the Jews of the East. It possessed a synagogue, a seminary (the president of which was called "rosh kallah," or simply "rosh"), a cemetery, a poor-fund, and various other institutions. It ransomed Jewish captives and contributed toward the support of the academies of Sura and Pumbedita as long as those academies were in a flourishing condition, and was an important intermediary point in the transmission of money from Spain to those academies. 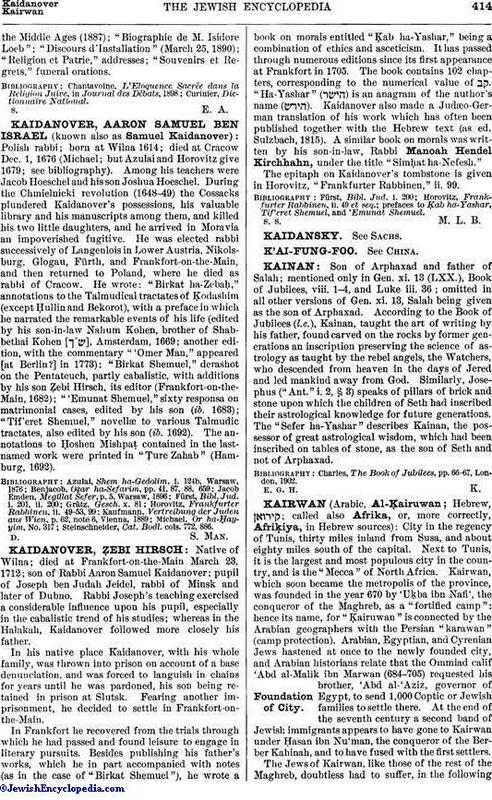 Scholars in Kairwan studied the Bible and both the halakic and haggadic departments of the Talmud; an old commentary to Chronicles speaks incidentally of the "great scholars of Kairwan" (R. Kirchheim, "Commentar zur Chronik aus dem Zehnten Jahrhundert," p. 18, Frankfort-on-the-Main, 1874). In questions of religious and civil life, during this period, appeal was made, from Kairwan as from other places, to the authority of the geonim in Babylon. In fact, a very active correspondence was carried on between the geonim and the scholars of Kairwan, and successive discoveries of fragments of these letters in the genizot have thrown more and more light on the intellectual activities of the city. It has been stated, with much probability, that Naṭronai b. Ḥabibai, defeated as a candidate for the exilarchate, and whom the Sherira letter (Neubauer, "M. J. C." i. 36) describes as having gone to the "West" ( ), went to Kairwan (Grätz, "Gesch." v. 175; F. Lazarus, in Brüll's "Jahrb." x. 176). There he is said to have written the entire Talmud from memory, and to have sent the congregations in Spain a copy. While Naṭronai b. Hilai was gaon of Sura (853-856), Nathan b. Ḥanina and Judah b. Judah b. Saul were judges in Kairwan (comp. "Sha'are Ẓedeḳ," p. 84a, No. 3; Zunz, "Ritus," p. 190), both of whom corresponded with Naṭronai (on the former, see the additions of Samuel ibn Jama' to the 'Aruk, s.v. [published by Dukes in "Orient, Lit." 1851, p. 358]; Solomon Buber in "Grätz Jubelschrift," p. 17, Hebr. part; on the latter, see S. D. Luzzatto, "Bet ha-Oẓar," i. 59b). In 880 the remarkable Eldad ben Mahli ha-Dani appeared in Kairwan, and attracted much attention not only by his accounts of his travels and by his new and unusual Hebrew expressions, but especially by the halakic innovations in his ritual. In response to the appeal of the perplexed Jews of Kairwan for enlightenment in regard to these changes, Ẓemaḥ ben Ḥayyim, gaon of Sura (882-887), merely assured them that they need not feel disquieted (see E. Epstein, "Eldad ha-Dani," pp. 4 et seq., 83 et seq., Presburg, 1891). It was probably in Kairwan that Eldad met the philologist Judah ibn Ḳuraish, who appears to have removed to Kairwan from his native city, Tahort. In five exegetic citations from scholars of Kairwan contained in the old commentary on Chronicles mentioned above (R. Kirchheim, l.c. pp. 16, 18, 22, 27), Judah ibn Ḳuraish is named in close association with their authors. Isaac b. Solomon Israeli (832-932; according to others, 832-942), who was born in Egypt, also removed to Kairwan. In 904 he was court physician to the last Aghlabite in Kairwan, Ziyadat Allah, retaining that position under the first Fatimite ruler, 'Ubaid Allah al-Mahdi. From Kairwan, Israeli corresponded on scientific subjects with Saadia, before the latter was called as gaon to Babylonia in 928 (Commentary on the "Sefer Yeẓirah"; see "Orient, Lit." 1845, p. 563). A famous pupil of Israeli was the physician and philologist Dunash ibn Tamim, who was born at Kairwan about the beginning of the tenth century and lived there all his life. Like his teacher, he was physician in ordinary at the court of the Fatimites; he dedicated an astronomical work to one of them. Besides these physicians, philosophers, and philologists, there were, doubtless, others whose very names, like the titles of their books, are scarcely known (Abraham ibn Ezra, Commentary on Esth. vii. 4 [ed. Jos. 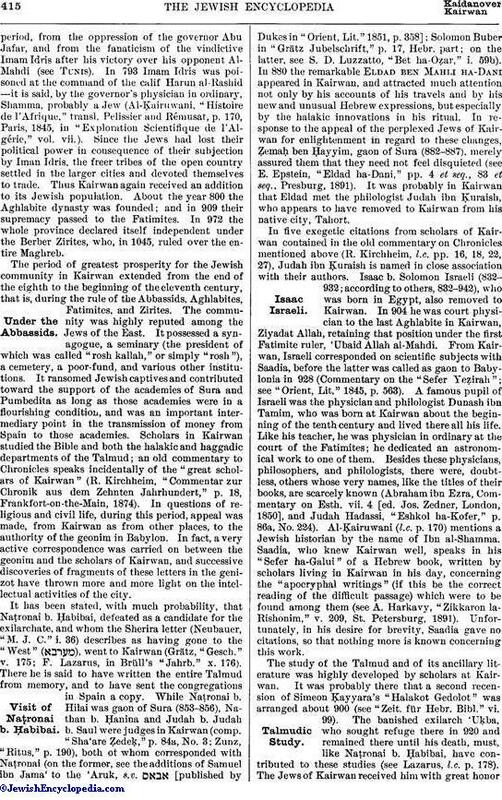 Zedner, London, 1850], and Judah Hadassi, "Eshkol ha-Kofer," p. 86a, No. 224). Al-Ḳairuwani (l.c. p. 170) mentions a Jewish historian by the name of Ibn al-Shamma. Saadia, who knew Kairwan well, speaks in his "Sefer ha-Galui" of a Hebrew book, written by scholars living in Kairwan in his day, concerning the "apocryphal writings" (if this be the correct reading of the difficult passage) which were to be found among them (see A. Harkavy, "Zikkaron la-Rishonim," v. 209, St. Petersburg, 1891). Unfortunately, in his desire for brevity, Saadia gave no citations, so that nothing more is known concerning this work. The study of the Talmud and of its ancillary literature was highly developed by scholars at Kairwan. It was probably there that a second recension of Simeon Ḳayyara's "Halakot Gedolot" was arranged about 900 (see "Zeit. für Hebr. Bibl." vi. 99). The banished exilarch 'Uḳba, who sought refuge there in 920 and remained there until his death, must, like Naṭronai b. Ḥabibai, have contributed to these studies (see Lazarus, l.c. p. 178). The Jews of Kairwan received him with great honorand made him their spiritual head (comp. "Ha-Manhig," p. 32a, § 58, with the "Sefer Yuḥasin," 120b). During the time of Sherira (930-1000), Ẓemaḥ b. Mar Bahlul was president of the seminary there (Harkavy, "Teshubot ha-Geonim," No. 48). Somewhat later Jacob b. Nissim ibn Shahin, the author of an Arabic commentary on the "Sefer Yeẓirah," occupied the same position. He corresponded frequently with Sherira Gaon and with Hai Gaon. At Jacob's request, Sherira sent him a letter concerning the composition of the Mishnah of the Talmud and the way in which it was transmitted to the Talmudic teachers (See Sherira; see also the interesting question addressed by Jacob's pupils to Hai concerning the miraculous power of the name of God, in "Ṭa'am Ẓeḳenim," p. 54; comp. also Harkavy, "Teshubot ha-Geonim," Nos. 230, 364). 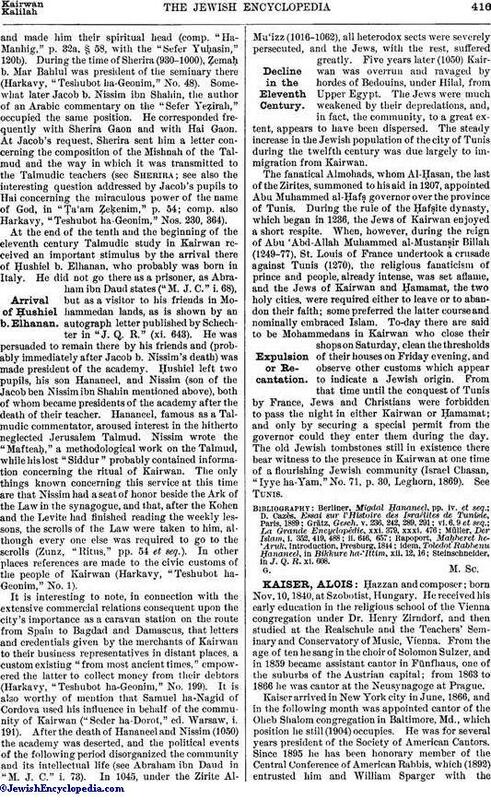 At the end of the tenth and the beginning of the eleventh century Talmudic study in Kairwan received an important stimulus by the arrival there of Ḥushiel b. Elhanan, who probably was born in Italy. He did not go there as a prisoner, as Abraham ibn Daud states ("M. J. C." i. 68), but as a visitor to his friends in Mohammedan lands, as is shown by an autograph letter published by Schechter in "J. Q. R." (xi. 643). He was persuaded to remain there by his friends and (probably immediately after Jacob b. Nissim's death) was made president of the academy. Ḥushiel left two pupils, his son Hananeel, and Nissim (son of the Jacob ben Nissim ibn Shahin mentioned above), both of whom became presidents of the academy after the death of their teacher. Hananeel, famous as a Talmudic commentator, aroused interest in the hitherto neglected Jerusalem Talmud. Nissim wrote the "Mafteaḥ," a methodological work on the Talmud, while his lost "Siddur" probably contained information concerning the ritual of Kairwan. The only things known concerning this service at this time are that Nissim had a seat of honor beside the Ark of the Law in the synagogue, and that, after the Kohen and the Levite had finished reading the weekly lessons, the scrolls of the Law were taken to him, although every one else was required to go to the scrolls (Zunz, "Ritus," pp. 54 et seq.). In other places references are made to the civic customs of the people of Kairwan (Harkavy, "Teshubot ha-Geonim," No. 1). It is interesting to note, in connection with the extensive commercial relations consequent upon the city's importance as a caravan station on the route from Spain to Bagdad and Damascus, that letters and credentials given by the merchants of Kairwan to their business representatives in distant places, a custom existing "from most ancient times," empowered the latter to collect money from their debtors (Harkavy, "Teshubot ha-Geonim," No. 199). It is also worthy of mention that Samuel ha-Nagid of Cordova used his influence in behalf of the community of Kairwan ("Seder ha-Dorot," ed. Warsaw, i. 191). After the death of Hananeel and Nissim (1050) the academy was deserted, and the political events of the following period disorganized the community and its intellectual life (see Abraham ibn Daud in "M. J. C." i 73). In 1045, under the Zirite Al-Mu'izz (1016-1062), all heterodox sects were severely persecuted, and the Jews, with the rest, suffered greatly. Five years later (1050) Kairwan was overrun and ravaged by hordes of Bedouins, under Hilal, from Upper Egypt. The Jews were much weakened by their depredations, and, in fact, the community, to a great extent, appears to have been dispersed. The steady increase in the Jewish population of the city of Tunis during the twelfth century was due largely to immigration from Kairwan. The fanatical Almohads, whom Al-Ḥasan, the last of the Zirites, summoned to his aid in 1207, appointed Abu Muhammed al-Ḥafṣ governor over the province of Tunis. During the rule of the Ḥafṣite dynasty, which began in 1236, the Jews of kairwan enjoyed a short respite. When, however, during the reign of Abu 'Abd-Allah Muhammed al-Mustanṣir Billah (1249-77), St. Louis of France undertook a crusade against Tunis (1270), the religious fanaticism of prince and people, already intense, was set aflame, and the Jews of Kairwan and Ḥamamat, the two holy cities, were required either to leave or to abandon their faith; some preferred the latter course and nominally embraced Islam. To-day there are said to be Mohammedans in Kairwan who close their shops on Saturday, clean the thresholds of their houses on Friday evening, and observe other customs which appear to indicate a Jewish origin. From that time until the conquest of Tunis by France, Jews and Christians were forbidden to pass the night in either Kairwan or Ḥamamat; and only by securing a special permit from the governor could they enter them during the day. The old Jewish tombstones still in existence there bear witness to the presence in Kairwan at one time of a flourishing Jewish community (Israel Chasan, "Iyye ha-Yam," No. 71, p. 30, Leghorn, 1869). See Tunis. Steinschneider, in J. Q. R. xi. 608.